Happy Tuesday! It’s already the middle of January and I can’t believe it. Usually January seems to drag on here in Montana because of the weather, but this year the weather couldn’t be more perfect. We have been enjoying getting outside and are growing very anxious for spring. Every year I get so excited for Valentine’s Day, it breaks up the long winter and gives us a reason to celebrate with those we love. 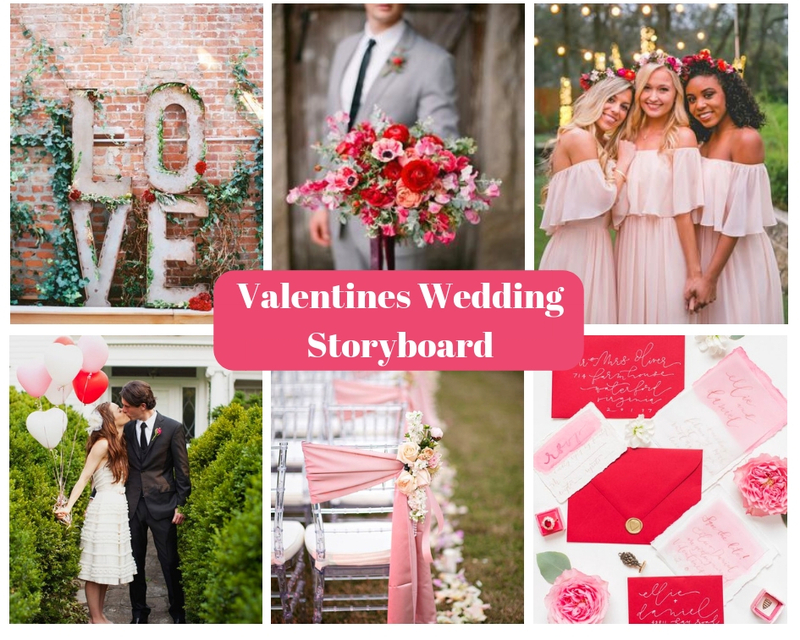 Last month I started a wedding storyboard series and this month I’m continuing it with a Valentine’s wedding storyboard! All of the pink, white and red makes me so excited! Even if you’re not planning a February wedding this color palette and flower selection is so pretty and can be use throughout the year. You can’t go wrong with celebrating your wedding and beginning your new life as husband and wife in the month that screams love! When I plan weddings for my amazing couples, a storyboard is where we start. I sit down with the bride and groom and talk about the feel and vision they have in their heads for their big day. After our initial meetings and phone chats, I come up with a storyboard to showcase all the design elements and vibe for their wedding. It’s a starting place and something that helps my clients see exactly what I’m talking about and the feel we’re trying to achieve. We don’t take every item and replicate it, a storyboard is more for the overall aesthetic feel and color palette for the wedding. It is also a big help for showing the vendors you are working with, so everyone is on the same page and they can fully envision the celebration. I absolutely love this storyboard and hope you love it as much as I do! 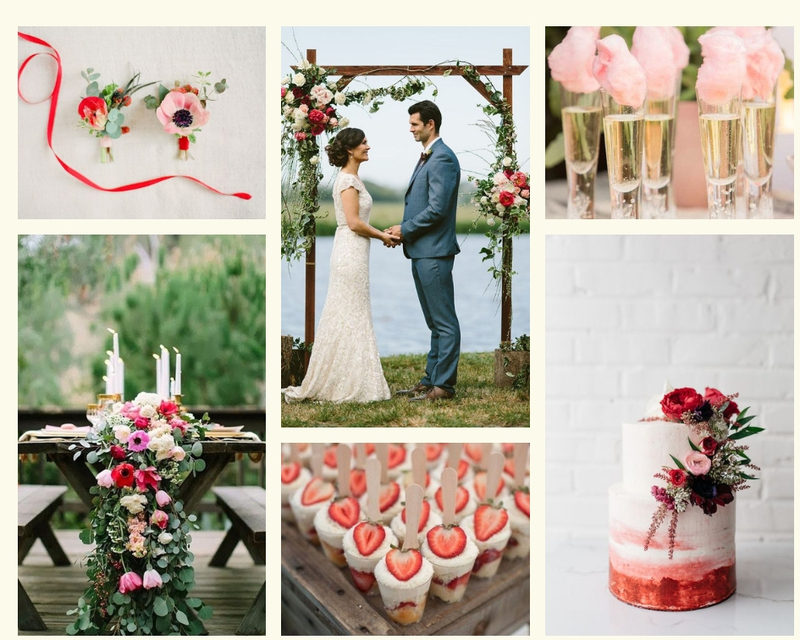 For this Valentine’s wedding storyboard I focused on shades of pink, white and touches of red and greenery. I’m a fan of using more shades of pink with splashes of red for Valentine’s day. Sometimes too much red can come across as more of a Christmas vibe especially if you have a lot of greenery. I wanted this storyboard to give the feeling of a fun celebration with bright pink, fun wedding pictures and an overflowing amount of flowers. I tried to mix up the flower arrangements and picked ones that weren’t traditionally full of roses. Pink and red spring flowers for Valentine’s celebrations is a fun twist on traditional. I loved creating this storyboard and can’t wait for the month of love to be upon us. If you are getting married and would like me to create a storyboard around your wedding ideas, let me know! I would love to come up with one for you and show it here on the blog! If you are looking for more Valentine’s wedding ideas check out my Valentines Pinterest board and my Pinterest page is full of so much wedding inspiration. 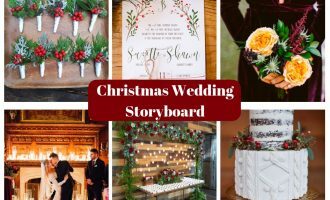 Last month I created a Christmas wedding storyboard that will be perfect if you or someone you know is planning a 2019 Christmas wedding. I hope everyone has a wonderful week and if you have any wedding questions or need some help please don’t hesitate to reach out. I would love to take your ideas and turn them into fruition!